HEALTH Minister Edwin Poots has officially opened up the new GP and Primary Care Centre at the main Downe Hospital in Downpatrick saying this is an important step towards the healthcare of the future. Replacing and improving on the former Pound Lane clinic damaged by fires, the model of integrated care, where two parts of the system – hospital and community- work together for the benefit of the patient, is a key element of the ‘Transforming Your Care’ initiative. 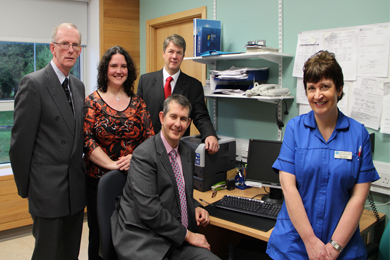 Downpatrick GP’s Dr Moore and Dr Small GP with SEHSCT Chief Executive Hugh McCaughey, Health Minister Edwin Poots MLA and Joan Owens, Treatment Room Nurse. Speaking at the launch today (Wednesday 17 January), the Minister said: “This is a superb facility and one which will bring real benefits to people from the Downpatrick area. “My aim, which has been reinforced by the Transforming Your Care report, is that the services provided by Health and Social Care are fit for purpose to meet the needs of patients, clients and local communities. “The previous facilities had been in great need of repair and did not meet the standards of a modern facility. Locating the new Health Centre within the Downe Hospital provides a modern, accessible facility for patients. The new GP and community facility replaces the Pound Lane Health Centre in Downpatrick, which was badly damaged by two fires in November 2008. Construction of the new centre began in October 2011 and the two GP practices of Dr Small/ Dr Moore and Dr McGoldrick/Dr O’Connor transferred in April 2012, followed by a wide range of community services such as district nursing, podiatry, community dentistry, physiotherapy and pain management in June 2012. The Health Centre is a stand-alone unit within the main hospital building, in addition to other dedicated services including the Midwifery Led Unit, Children’s Centre and GP Out Of Hours Service. These services enable the integration and future sustainability of Health and Social Care services for the local community and has been endorsed in‘Transforming Your Care’. Patients attending the new facility can avail of the hospital’s excellent general facilities including car parking, café, restaurant and shop. Feedback received from patients on the new facilities has been overwhelmingly positive. “It would be my hope that the accommodation of Primary Care Facilities within the Downe Hospital will lead to further developments in care for patients of the GP surgery. “The issue of accessibility for the pubic to the new GP surgery is of paramount importance. I have raised the matter with Translink calling for more regular bus services to the Downe Hospital and the adjoining Downshire Civic Estate, where we have a wealth of public service now located. Local accessibility at the point of delivery is crucial to the sustainability of any service. Sinn Féin MLA Caitriona Ruane attended the official opening of the GP and Primary Care Centre unit at Downe Hospital and said that the state-of-the-art facilities will help service the health needs of the local population for years to come. Ms. Ruane said: “This unit is a great example of how we can integrate community and hospital care under one building to provide a range of services that compliment each other. “The local community will undoubtedly benefit from a facility like this new unit as many services can now be accessed I one place. I am delighted that as well as physical health there is also a focus on mental health provision within the building. * Two GP Practices: * District Nursing * Treatment Room Nursing * Health Visiting * Specialist Nursing * Podiatry * Community Dentistry * Social Care: Care Management * Assessment / Rehabilitation /Intermediate Care * Speech and Language Therapy * Physiotherapy * Adult Mental Health * Mental Health Older Person Team * Pain Management * Addictions Clinic * Orthopaedic ICATS * Sensory Support.